What to do when the “honeymoon ” is over ? In the opening pages of our book The Next Step: Planning the road through Retirement” I commented on steps that we take through life and how these compare with the human contribution to creating a child. While I hope my explanation gave rise to a few chuckles, I do believe the similarities exist and should be seriously compared. Within each of these steps are smaller steps, which influence us while we complete each one. The future has started to resemble the “same old, same old” and they feel it could well become that on to oblivion. If this applies to or is relevant in, your life it would be true to say that “the Honeymoon is over”. This time, when you realise that “the Honeymoon” is over, is very important. How you address this situation can have a large effect on how you will live your life in retirement. Even though you have, hopefully, already made a retirement and have already put that plan into action with success, the way in which you address this new position will determine how successful and fun-filled the rest of your life will be. 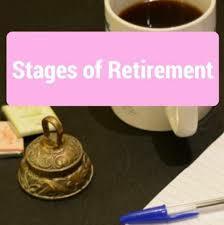 I suggest that, at this time, you dig out the plan you have already made for your retirement and examine how it matches the reality of your current situation. If it does and you remain happy and fulfilled in your personal situation then all you need to do is continue with your life and maximise your personal reward from it. Think of ways in which you can duplicate these feelings in your current situation. Encourage you to continue measuring your progress. Modifying your daily programme as you age is natural. Those things that are important seem to be changed over time and you find that, for example, the importance of always being immaculately attired gives way to becoming more comfortably so. Similarly, while the early morning jog, which we squeezed in between waking and work has turned into a walk with the dog, during which we interact with others on the road, and thereby ensure we remain up to date with local news. How does my lifestyle suit my needs and desires? What must I change and how will that change reflect in the rest of my life? How will a revised plan affect my financial position? What steps must I take to protect my wealth, particularly my capital? What new opportunities have arisen and what, if anything, do I want to do about them? How would taking advantage of them affect my current lifestyle and would this be acceptable? Satisfaction and happiness are normally found outside yourself so follow them there – outside yourself. If you are one of those who has not yet made the effort to plan the life you want to live in retirement, I suggest you purchase a copy of our book and start with that exercise first. The book is titled “The Next Step: Planning the road through Retirement” by Andrew Blaine and Barry Smith and is available from the authors at either andrew@the-next-step.co.za or barry@the-next-step.co.za. You will have great fun, I assure you.